October is the Month of the Rosary – Pray the Rosary! everything else; it’s out of our control; now all that is left is to pray. powerful tool we have is Prayer. to protect Him, to love and cherish Him? Was it not Mother Mary? fifty roses we place into a bouquet for her. 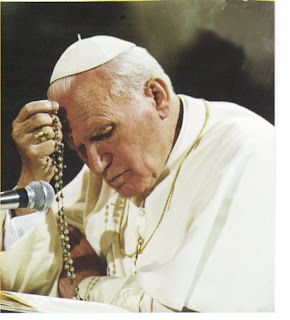 Popes all prayed the Rosary. Family, when we gave a talk in a church, Penny and I always asked our audience to think about their mother. The reactions were varied, and very often surprising. Most would smile and reminisce about times with their mother when they were young. Others would grimace. We always found it strange. Then we asked them to think about our Blessed Mother. We always got a good reaction then. Actually it was my darling wife Penny, who coined the phrase, Many Faces of Mary in 1983. It was a warm summer day in Italy. The afternoon sun cast its shadows from the buildings onto the pavement of the sleepy narrow Corso Boccalino, which leads to the Holy House in Loreto. As we walked down the street towards the famous shrine to Mary, we praised and thanked her for the relief from the heat the shadows afforded us. It was a lazy day, partly because of the heat, and partly because of the conversation with our luncheon guest. He was a young Italian manufacturer of religious articles, Paolo Georgetti. He was eager to know why people prayed to Mary under so many different names. He used the pretext that he was interested in manufacturing plaques of Our Lady, but we could tell from his conversation that he had been seriously flirting with the Jehovah’s Witnesses. Young Paolo started to laugh, sarcastically. “But signora, how many ladies can there be?” The sound of his laughter ricocheted off the buildings, assaulting the peaceful silence of the afternoon. It was like a shriek against our ears. We felt as if he had blasphemed. Family, this month, August 15, we will celebrate the Assumption of Mary into Heaven, Body and Soul. It was after this that she was able to help us in so many ways, in so many titles, with so many faces. The following week, August 22, we celebrate the Queenship of Mary, when our dear Mother Mary was crowned Queen of Heaven and earth, of all the Angels and the Saints. Everyone who has ever visited Our Lady’s Shrine in Lourdes, France, has a special place where they just like to be with Mary. It could be the Grotto where Our Lady appeared to St. Bernadette 18 times in the year 1858. It could be the Blessed Sacrament Chapel. It could be the Miraculous Baths or the Way of the Cross. My special place for the last 40 years has been the Basilica of the Rosary. I go up to the very front row and sit on either side, and just look above the altar on the dome at this beautiful mosaic of Our Lady, dressed as Queen of Heaven and Earth. She wears her Crown and is dressed in a white gown with a blue sash. A cape of ermine drapes her shoulders. She looks straight at me. I can walk anywhere in the Basilica and her eyes follow me. I cannot escape her. I never want to escape her. She is there, and she is talking to me and to you. If you get everything out of your mind, you may hear her. Every time I go there, I tell her that this may be the last time I see her. She just smiles. I’ve been saying that for years. We Catholics have always believed in the Assumption of Our Lady into Heaven. It was just a part of our Faith. But the world started to go tipsy towards the middle of the Nineteenth Century. There had been a popular heresy spreading all over Europe called Pantheism, which claimed that man was equal with God. In 1854, in the midst of all of this, and in the face of massive opposition, His Holiness, Blessed Pope Pius IX declared a Dogma of the Church, the Immaculate Conception, by which all Catholics were required to believe this. What His Holiness declared was that, with the exception of Jesus, only Mary was born without the Stain of Original Sin. The rest of us were heirs of Adam and Eve, and all that went with that. There was an uproar inside the Church in Catholic Circles, and outside the Church in Protestant circles. It was outrageous, they claimed, to give this singular honor to a woman. Shades of Lucifer. He said the same thing when told that a woman, Mary, would be Queen of Heaven and Earth, of all the Angels and the Saints. Honor her on her Feast Day this Saturday, August 15, and for the rest of your lives. We love you! You are currently browsing the archives for the Mysteries of the Rosary category.